I have mentioned before that I love spicy foods and usually ask for the hottest sauce around when I go out to eat. D-Money makes fun of me and says that my need for spicy foods burned all my taste buds and my food needs to be extra spicy now so that I can actually taste it. I don’t agree with that because I think spice adds a beautiful dimension of flavor to food and my taste buds are just more…. mature. In the end, we will probably never agree on what the right level of spice is. Despite our disagreement about spice levels, I have gotten him to appreciate jalapenos. We top pizzas and salads with them, stuff quesadillas with them, add them to eggs, and on warm sunny days we stuff and grill them. 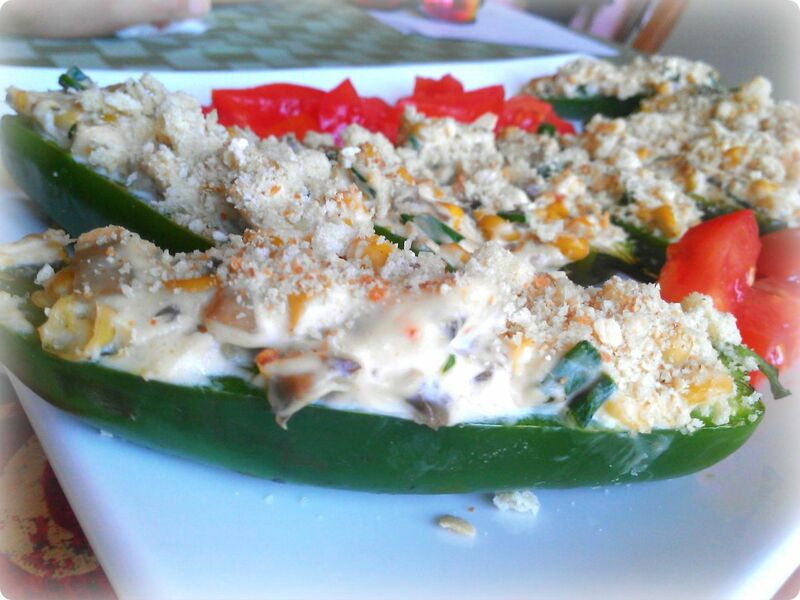 A good friend of mine makes a version of this with cream cheese stuffed jalapenos wrapped in bacon. I loved the concept but needed to modify because of the whole not eating meat thing. 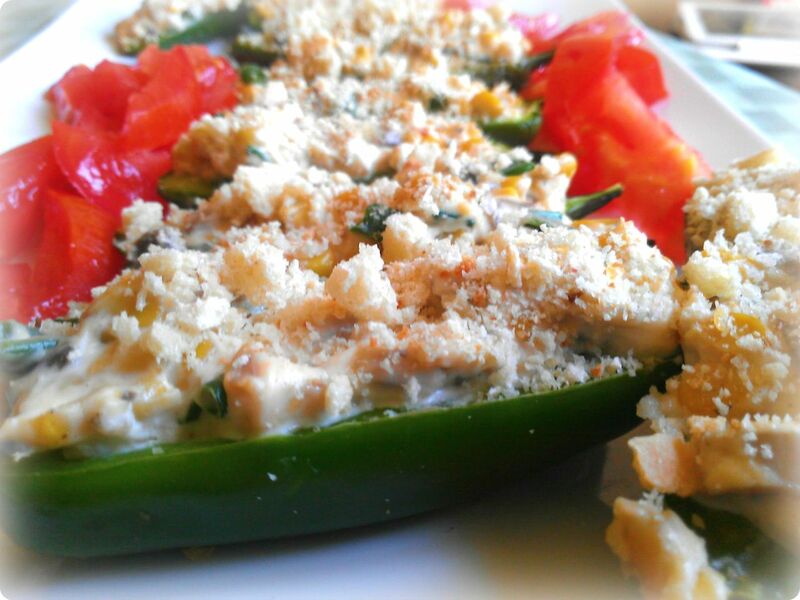 I wanted the modification to be just as appealing as the original sans the bacon and figured that stuffing jalapenos with only cream cheese was not the way to go; so I added some seasonings and some veggies to the mixture and topped it with homemade breadcrumbs. This modification is simple and satisfying and I hope you give it a try (these are great for social gatherings)! Heat your outdoor grill to the grill setting/temperature. In a large pot, boil the corn in salted water for 5 minutes, remove and let cool completely. In a medium mixing bowl, add the Neufchâtel cheese, onion powder, green onions and garlic powder and mix. On medium high heat on a medium pan, add olive oil, salt and pepper and mushrooms and cook for 3 minutes. While that is cooking, take an ear of corn, stand it up tall, and using a sharp knife, scrape the kernels off the cob for fresh and crisp corn (you can use canned corn but it won’t be as crisp). Repeat the process for the other ear of corn. Add the corn kernels to the mushroom mixture and cook together for an additional 2 minutes. Remove from heat and add to the Neufchâtel cheese mixture and mix together well. Using a spoon, stuff the jalapenos with the mixture. Be generous with the stuffing. 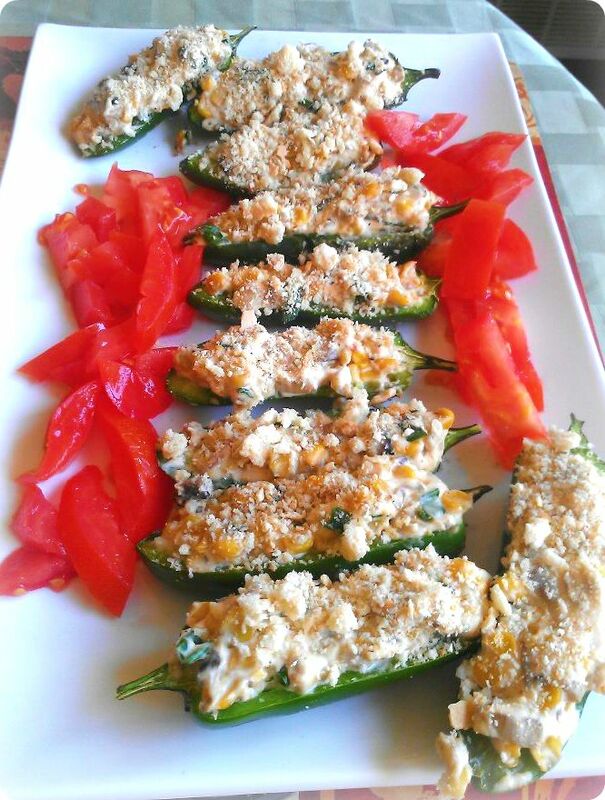 Sprinkle the break crumbs over the stuffed jalapenos and add them to the heated grill. Cook for 12 minutes or until there are grill marks on the jalapenos. Serve with a side of diced tomatoes to help keep the spice at bay. Enjoy while warm and enjoy the spice! Thank you! I have tried them wrapped in bacon and stuffed with cream cheese but not with cheddar- sounds like something I will definitely have to try on one of my meat cheat days!